Asheville Citizen-Times Publisher Randy Hammer says there had been talk of combining production at the North Carolina paper with its sister Gannett paper, The Greenville News, 63 miles south, in South Carolina. “The economic downturn we’re seeing across the nation has pushed us to make this move sooner rather than later,” Hammer said, according to a story on the paper’s website. Although 60 jobs will be eliminated in Asheville, some of the employees laid off could transfer to new jobs being added at Greenville to handle the extra work, the paper says. But any press job cuts will be on top of those eliminated at Asheville in the 10% workforce reduction now underway; those additional layoffs will be announced early next month, Hammer’s memo says. Two weeks after dumping their production director, a reader here says, the Asheville Citizen-Times in North Carolina could not get the newspaper out this morning, so had to print at a sister site in Greenville, S.C. “Papers were two to three hours late,” the reader says. Lost your production director in the layoff of 100 managers? What’s the impact? Please post your replies in the comments section, below. To e-mail confidentially, write gannettblog[at]gmail[dot-com]; see Tipsters Anonymous Policy in the green sidebar. Earlier: And Corporate’s rate is a fat 55 cents, say Gannett Blog readers, now commenting on the abysmally small mileage increase at South Carolina’s Greenville News. Join the debate, in the original post. What’s your mileage reimbursement rate? When’s the last time it went up — and by how much? Leave a note, in the comments section, below. Or use this link to e-mail your reply; see Tipsters Anonymous Policy in the green sidebar, upper right. This is today’s Greenville News in South Carolina; click on the image for a bigger view. All eyes are on the state’s Democratic primary today, where Sens. Hillary Rodham Clinton, Barack Obama and John Edwards are in a tight race. 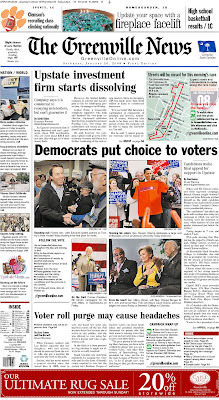 Online, the News says state election officials reported “no problems Saturday morning as residents headed to Democratic primary polls a week after one county’s voting machines failed to function properly during the GOP primary.” In print, the News has a strong Page One refer (inset, left) to its rolling online coverage. Election focus shifts to Michigan, Nevada, S.C.
With a combined seven newspapers and one TV station in those three key battleground states, Gannett is now well-positioned to be a bigger presidential campaign player in the crucial weeks ahead. For Democrats Hillary Rodham Clinton and Barack Obama, the immediate focus are the Jan. 19 Nevada caucuses. They’re shaping up as the “head-to-head test of the strength of both these candidates,” the NYT says. The Reno Gazette-Journal said today that mining and the residential foreclosure crisis will play big roles in the caucuses. And in South Carolina, Gannett’s Greenville News says GOP candidates “still standing after two bruising contests began assembling at Myrtle Beach to prepare for tonight’s nationally televised debate, a scene-setter for the state’s Jan. 19 primary.” The News has loads of video on the candidates, too. “South Carolina is going to be a turning point in this nomination process,” Republican candidate Mike Huckabee of Arkansas says, according to today’s Washington Post. 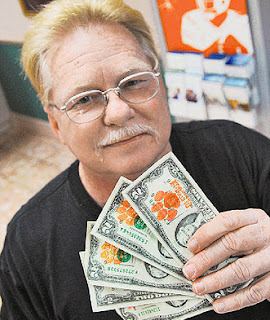 Jerry Kelly holds $2 bills stamped with orange Clemson University “Tiger paws” that he got from a bank in Clemson, S.C. He and other Tigers fans will spend the bills at Monday’s Chick-fil-A Bowl in Atlanta to show the economic impact of fan spending, The Greenville (S.C.) News says today. Photo by Alan Devorsey, News. You are currently browsing the archives for the Greenville category.